Nation building is the result of people living in multiple ways choosing to identify themselves with an imagined community, the Nation. The social contract so forged between the members of this entity comes with secession of some rights, and accordance of some others. In this dynamic process of co- option of multiple ethnicities by the Nation-State, do the seeds of conflict lie. Negotiating Conflict 2012 attempts to answer the question of the hour when thousands of people lie homeless and derelict in rehabilitation camps of Assam and the country basks in the afterglow of the largest internal exodus the country has seen since independence. It tries to trace the roots of such conflicts against a background of Ethnic identity struggles, and study them in the light of their political philosophical underpinnings. The question of “conflict” no longer bothers the inquisitive academic alone. It extends to the very ground really of our existence. And the Development Studies stream looks forward to understanding, enlightening and mobilizing thought on this issue through Paper Presentations, Panel Discussions, and Keynote Lecture by Dr Shail Mayaram. Check-out the Schedule for more details. 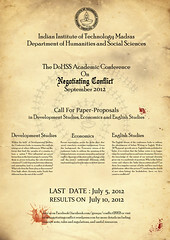 The Department of Humanities and Social Sciences, IIT Madras is organising its second academic conference in the month of September, 2012 under the overarching theme of ‘Negotiating Conflict’. The two day conference will have a session each on Economics, English Studies and Development Studies offering an array of lectures, panel discussions by the leading thinkers and paper presentations by students. For queries, please mail at: negotiatingconflict2012@gmail.com. This entry was posted in Articles and tagged Development Studies, Dr Shail Mayaram. Bookmark the permalink.